Full Tilt Poker players will find an interesting bonus offer waiting for them the next time they log into the site: Full Tilt Poker is offering all current players a bonus of $50 to all of its players. 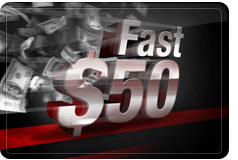 Players have until 23:59 ET on March 14th to accept their Fast $50 bonus offer. By accepting the offer players will immediately have the $50 in bonus placed into their bonus account, no deposit is required! Making this a easy poker site to clear a bonus. The bonus is meant to promote Full Tilt Poker’s newest game variant: Rush Poker. Rush Poker is a fast paced version of a typical poker game where players are never without cards. As soon as a player folds his/her hand they are immediately transported to a brand new table, with new opponents, and another hand is dealt. Full Tilt’s no-reload bonuses have been a hit among poker players, especially US players who are having increasing difficulty transferring funds to and from their online poker accounts. If you are looking to sign up to Full Tilt Poker, check out these sites first. Best Poker Site for information on why Full Tilt is the best poker site and Best Full Tilt Bonus to make sure you get the best bonus possible. This entry was posted on Tuesday, February 23rd, 2010 at 8:49 am and is filed under Poker News. You can follow any responses to this entry through the RSS 2.0 feed. You can leave a response, or trackback from your own site.